Situated smack in the middle of the southern Nevada desert, Las Vegas has long been a popular destination for gamblers seeking to strike it rich in the many casinos lining the famous Strip. But in recent years, Sin City has expanded its tourism offerings beyond just slots and blackjack, and the town now serves up ample live entertainment, sumptuous buffets and even theme parks for visitors of all ages. Las Vegas is situated in the Mojave Desert in Nevada, directly west of the Colorado River, east of Death Valley National Park and north of the Mojave National Preserve. Interstate 15 cuts right through the city, connecting it to Southern California destinations such as Los Angeles (a four-hour drive away) and San Diego (closer to five hours from Vegas by car). Phoenix, Arizona, takes around five hours to reach by car, while Salt Lake City is about six hours away. Like much of the Southwest, Las Vegas is generally dry and warm most of the year. December and January can get a bit chilly, with temperatures in the low 50s at times, while summers can be quite hot. Just 50 miles north of the city, stunning landscapes and stellar opportunities for outdoor recreation provide a perfect antidote to Vegas’s neon kitsch. 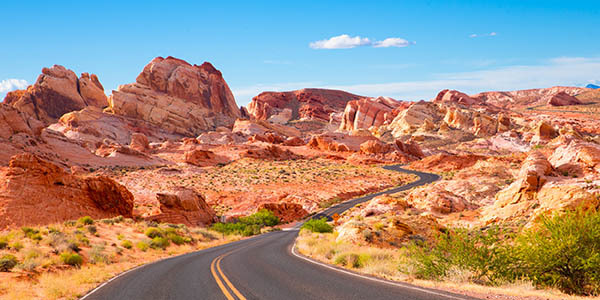 The red rocks, serrated peaks, enigmatic petroglyphs and surreal sandstone formations of the Mojave Desert are gloriously accessible at the Valley of Fire State Park. The 40,000-acre park’s vibrant red geology, formed from shifting sand dunes over 150 million years ago, displays shapes that seem to twist, contort and swirl. The effect is almost hallucinogenic. After taking photos of Elephant Rock, Fire Wave and Balanced Rock, visitors will understand why the area was once deemed sacred by the ancient Anasazi Indians, who originally inhabited the region. If you prefer recreation on the water, you’ll find an ample supply both upstream and downstream from Hoover Dam. Straddling the border between Arizona and Nevada, the Lake Mead National Recreation Area comprises Lake Mead, Lake Mohave and a picturesque section of the Colorado River. With nearly 800 miles of shoreline combined, Lake Mead and Lake Mohave constitute a mecca for water sports enthusiasts. As well as boating, kayaking and jet ski tours — which include photo stops at the Hoover Dam — there’s superb fishing for striped bass, rainbow trout and sport fish. While most active travelers flock here for the water, more than 87 percent of the park protects a huge swathe of the eastern Mojave Desert, where vast, surreal, multi-hued expanses of rock can be explored along scenic trails. Visitors may be surprised to learn that Vegas and the surrounding area are home to some great museums. Local attractions include the Mob Museum, which covers mafia history. Check out the actual electric chair briefly occupied by Albert Anastasia, a Cosa Nostra mobster who operated in New York’s underworld. The Neon Museum dazzles visitors with displays of glowing splendor; take a walk in the “boneyard” of old neon signs that once illuminated the Strip. On the outskirts of town, the Clark County Museum features a living history area with old restored buildings ranging from an early 20th-century newspaper printing shop to an old wedding chapel. History buffs will appreciate the Anna Roberts Parks Exhibit Hall, with a timeline tracing local life from the early Pueblo days. To the north, Clark County Wetlands Park is a hidden treasure of rivers and lakes fringed with cottonwood trees, where a profusion of birds, mammals, bats and insects find refuge. The source of the city’s water, the wetlands are naturally formed from six natural washes that flow from the west to the east of the Las Vegas Valley before eventually washing into Lake Mead. 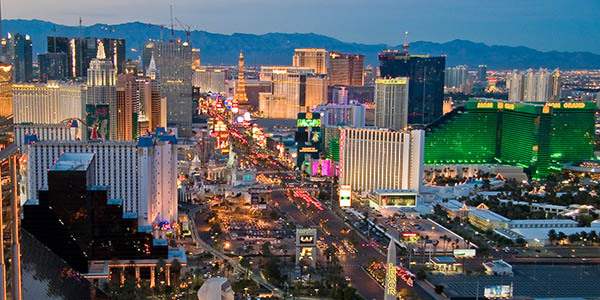 Las Vegas is synonymous with casinos, and the Strip is known for its themed casino hotels. There’s the Greco-Roman-themed Caesars Palace, complete with the Fall of Atlantis animatronics show, along with Bellagio’s an elegant, stunningly choreographed fountain displays. Treasure Island puts on a pirate show with pyrotechnics and daring stunts, while the sleek Cosmopolitan offers sophisticated concerts and parties. Other themed casinos include New York-New York, with its own Statue of Liberty replica, and the famous Luxor Hotel and Casino, which takes on ancient Egypt with replicas of the Sphinx and Cleopatra’s Needle. As the name suggests, the Venetian recreates the canal-filled scenery of Italy’s most romantic city complete with gondoliers decked out in Venetian outfits. Although most people come to Vegas to gamble, there are plenty of other activities for families or those who prefer to guard their cash carefully. Live entertainment is big business here, with everything from music performances to off-Broadway musicals to magic shows, not to mention Cirque du Soleil and Blue Man Group performances. Some of the city’s casinos also function as theme parks, complete with rides galore. New York, New York offers an indoor roller coaster, while Circus Circus has its own theme park — the Adventuredome — boasting a couple of dozen rides and attractions, including two roller coasters. The Stratosphere Casino, Hotel and Tower features a roller coaster and a drop tower, plus Sky Jump, billed as the world’s highest controlled descent. For a quirky shopping experience, take a stroll through Container Park in downtown. Stick around during the evening to see the giant praying mantis sculpture shoot flames from its antennae. Most visitors to Sin City make a point of getting in touch with their inner glutton at one of the city’s many famous all-you-can-eat lunch buffets. Most feature spreads with hundreds of dishes from around the world, often washed down by endless bottles of sparkling wine. Popular stops include the buffet at Bellagio, with everything from sushi to chocolate cake available — just be prepared to stand in long lines to get in, as this is one of the city’s most popular buffets. Alternatives include Rio Carnival World, which offers a spread of Asian specialty items, as well as the seafood-heavy buffet at the Wynn. Many offer discounts for children, and at Circus Circus kids under age four eat free. Take a dive into history 33 miles east of Vegas with a tour of the Hoover Dam, deemed one of the seven wonders of the industrial world and one of the greatest engineering feats in history. There’s no shortage of superlatives to describe the iconic, art deco-style Hoover Dam that harnesses the current of the Colorado River. When it was completed in 1936 to supply electricity and water to Arizona and California, it was the world’s highest and most powerful dam. Standing at 726 feet tall (that’s roughly the same as a 70-story building), the dam must be seen to be appreciated. The 30-minute Powerplant Tour includes terrific views of the dam, interactive museum exhibits and then an elevator ride to stand on top of one of the 30-foot pipes, where you can experience the primal potency of water surging through to the generators. Visitors get an appreciation of the 90,000 gallons of water that flow through here per second, along with the 4 billion kilowatt-hours generated every year. After touring the dam, visit the town that once housed the dam’s many builders and engineers. Boulder city, located 8 miles east of Hoover Dam, pays homage to the construction effort with the interactive Boulder City/Hoover Dam Museum. Exhibits relate the social and economic impact of the dam’s construction. For train lovers, the Nevada State Railroad Museum is a showcase for locomotives, train cars and train-themed memorabilia. Dine at the extraterrestrial-themed Flying Saucer (Area 52), where you can enjoy tasty meals and shop for off-beat alien paraphernalia.